On my way out of La Habana, returning to my casa, I prepared to do battle with the queues for the bus….it is a chaotic experience, and those who survive it have to be battle-hardened. I approached the queue and asked ¿el último?….who’s the last? A gentleman told me he was at the head of the queue, but told me to stand next to him….I was puzzled at first, but we got talking. I gained his confidence, and he slowly gained mine. When I asked eventually what he did for a living, astonishingly he told me he was a cardiologist, but he had a second job supervising infants in a nursery…..I was struggling to fully appreciate what he was telling me. One of the few people I’ve heard say anything negative about Cuba, he told me that he was not allowed to earn more than $50 per month, and that the average wage for most people was $15-20 per month. It was then I understood why he was fighting the unruly queues to squeeze into the state-subsidised buses……but even more astonishingly, he slipped me the 40 centavos (2p) for the fare, got me into the bus, and grabbed a seat for me. Quite bewildering, really…..
And before I leave Cuba, I wonder if anyone could enlighten me why the Irishman O’Reilly should be honoured with a street name? On a plaque it said “Two island peoples in the same sea of struggle and hope: Cuba and Ireland”. In all its crumbling magnificence, La Habana has not changed at all in the 15 years since I was last here. It is still crumbling away, but scaffolding around its Capitolio suggests they are trying to do some restoration. Sixty years ago, before the revolution, the city was the richest and most lavish in the Caribbean, but lack of money and expertise since the revolution quickly saw it deteriorate in succeeding years. …while one of the museums celebrates a Cuban interpretation of Mexican papier mache art…..note the Habana cigar in the dragon’s teeth…. …and, of course, one of the city’s many defining characteristics are the fleets of lovingly restored American classic cars, many of which got into Cuba via Venezuela. A vibrant city, a honeypot destination for people from across the world, but as I sat on an overcrowded bus on my 5 centavo journey to the suburbs, the faces of the people betrayed history’s ethnic melting pot that Cuba is. Every thing from black Congolese to the purest white Caucasian is evident in Cuba’s racial mix…..but never once have I been aware of any racial tensions. It just doesn’t seem to figure in their thinking…..
Fifteen years ago, in 2002, I brought a large group of pupils, staff and parents over to Cuba for a 10 day guided tour of the island. It was a very successful trip, not without its issues of health and safety, but we got everybody safely back home just in time for Christmas. But I want to focus on just little event, which happened on a walking tour of La Habana. As we crossed one of the plazas, keeping everyone together as best we could, it turned out that a street artist, a caricaturist, had walked beside me (just one step behind so I didn’t see him) and he had very quickly drawn a caricature of me. This had been set up by one of the pupils and, before we left the plaza, the artist presented me with the finished product. And like all caricatures, it wasn’t really me, but…..and this is the skill of the caricaturist…..he captured something about me that definitely did make it me, and I’ve kept it all these years, and framed it, as a memento of that moment. So why do I tell you this little anecdote from the past? Well, the other day, I was sitting in a bar tapping in a post for my blog, and it would seem that another secret caricaturist (Cuba must be full of them) was busily at work, obviously outside my line of vision, and taking advantage of my distraction. The first I knew about it was when he came over and put it on the table in front of me. He left me to get over my surprise and study it, then came over hoping for a donation…..which I did honour for his labour…..but my immediate reaction was “that’s not me, flattering though it is, because he seems to have captured something about me when I was 20-30 years younger”. But after several minutes, I realised he had captured something about me that ……… well, simply made it me. 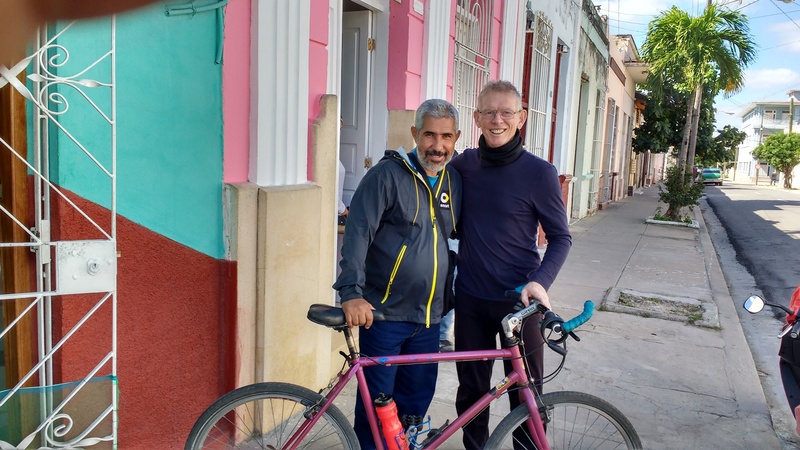 Heading to the city of ‘a hundred fires’, I had decided to make this the last day of cycling in Cuba, and hand over my faithful old steed to Sergio…..except that Sergio lived in Sta Clara, about 100km away. But he was so excited about the gift, he said he would borrow a camión and come and fetch it. A more deserving recipient I could not have found. When I first met him, there was an immediate meeting of minds….we found ourselves on the same wave length from the first moments, we shared a lot of conversations over a wide range of subjects….in short, we were very comfortable in each other’s company. Staying at the casa of a friend of theirs here in Cienfuegos, he was able to find me quickly this morning, and we went out to a peso eating place (where only Cubans generally eat, at state subsidised prices) and had a couple of beers and a pizza. He was trying to thank me for the bike, but this 30 year old wonder was needing a new home, so I explained some of its peculiarities: it’s quick-release wheels and saddle, how the 21 gears worked, the Girvin flex stem…..all of this is old technology to us, but not to the average Cuban. He had left his truck on the outskirts of the city, so he had to take courage and climb on the bike in front of me……and great to say I didn’t detect even the slightest wobble. When I told him the history of the bike, the countries that it has visited and the number of kms ridden (probably 80-100,00kms), he adopted an immediate reverence towards it. I asked him if he might plan any trips, and he told me he likes to go lake fishing at weekends, so will already be doing regular 30km trips. During my two night stopover as a guest of Elsa and Sergio, I feel they have become good friends. On the second evening, they invited me to supper, opened a bottle of Cuban wine (sweet, like an oloroso sherry), brought out the beer, and refused to charge me. In the company of an Argentinian couple, we talked for hours, me stifling my amusement at the Argentinian accent…..which I find very funny. Alone in the company of Elsa and Sergio, they plied me with questions, especially about my bike trips, but as I put details on some of the trips, I could see in their eyes a sad longing for all the opportunities they have missed out on. They were children of the revolution, and they’ve known nothing else. They have borne the restrictions and deprivations all their lives, but they never uttered a single negative word about it…..obviously great believers in all the revolution stood for. The ‘special period’ in the 90s, after the collapse of the Soviet Union, was especially difficult. They had lost their only trading partner in the world, which meant their economy collapsed, and the shortages were so acute that the average body weight of Cubans dropped by 10%. Fighting their own battles, with no friends in the commercial world, means that if a crop fails, there is nothing to replace it. For instance, after the recent hurricane Irma, fruit crops were completely destroyed, meaning that they simply had to do without. At that moment bananas, the cyclist’s best friend, are completely off the menu…..but my breakfasts have still included papaya, guava, pineapple and orange…..so things are improving. Sergio has expressed a serious interest in having my bike, especially since he had his stolen a few months ago. He likes to take his grandson about on a special kiddy seat he made of wood, and he is prepared to travel to pick it up ……so watch this space. I feel he will be a very worthy recipient. Much of today’s 87km route was on a nicely surfaced country road, allowing me a couple of convenient pitstops in villages. But even better than that, a ‘cold front’ had come in, meaning the temperature had actually dropped to 20C, and the wind was generally behind me (in good panto tradition, of course)….it was a huge relief not having the sweat pouring off me for the whole ride. When it is hot in Cuba, it can be oppressively hot…..especially for cycling. I want you to be impressed, but not because I cycled the 500km eastwards to get to Santa Clara, in central Cuba. No…….. I want you to be impressed that I actually survived two ‘white-knuckle’ rides in colectivo taxis. The first was driven by Pedro, to La Habana, with four passengers (including two Swedes and a south Korean), and my bike strapped on the roof. His Lada was the equivalent of my £50 bangers in the 70s, with the same lack of any safety features. He drove it at breakneck speed through torrential rain storms, all the while on his phone touting for business for his return journey. And I discovered that everyone drives in the fast lane on the highway (and overtakes on the slow lane) because there are fewer potholes in the fast lane. I got out of that car feeling completely rung out. My next colectivo, from La Habana to Santa Clara, was a more controlled experience (and I shared this ride with three Cubans), but it broke down when we stopped at a service station in the middle of nowhere. After a lot of fettling under the bonnet, the driver finally kicked it into life…..and yes, it was yet another damned Lada. 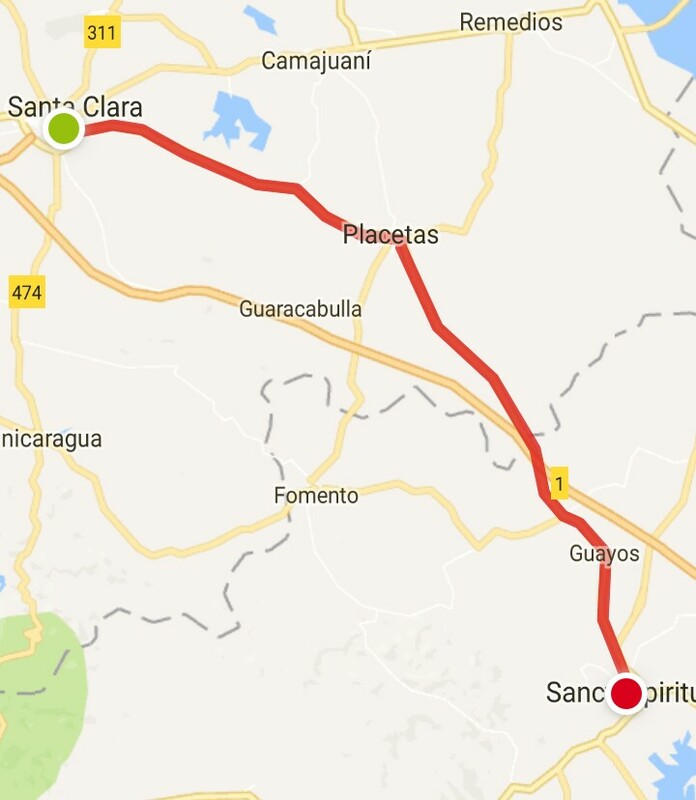 So I am now in Santa Clara, a town which is synonymous with Che Guevara and his memory, where his mausoleum is situated, as is a variety of other reminders of when the Cuban Revolution came to a successful end, and when Batista fled to pastures new. But more of that later…..
a lush green landscape noted for its tobacco crops and continued use of traditional methods of cultivation. Yes, fields are actually still ploughed using a pair of oxen…..and they are beautiful beasts. I checked into the first casa I chanced by, met a neighbour who will look after the bike, and had a very interesting chat with the man of the house, and surprisingly, he knew all about Brexit, and had some stark things to say about Donald Trump. Of course, we all now know that the so-called ‘sonic attack’ on the US embassy in La Habana was completely fabricated by the Americans, seemingly as an excuse for severing diplomatic relations once again with Cuba……..I leave you to ponder that one for yourself. Accessing the internet is a curious business in Cuba. One thing that stands out is that Cubans are never seen using their devices along streets, in restaurants, or even at home. Why? Because there is no home provision of wifi for anyone other than important public servants, and there is definitely no mobile data for anyone. To get online, everyone has to buy a data card, costing at least £1 per hour, and they can only connect at hotspots, usually in small parks and public squares. The big question is: how to find the hotspots, because they are not signed in anyway. I’m sure you’ve already worked this one out……..yep, look for clusters of people intently using their devices. That is the only way….. Despite these restrictions, many Cubans seem to be very internet savvy, and everyone under a certain age (40, perhaps) will have a smartphone. But, of course, smartphones are not very smart in Cuba…..yet. Talking of deprivations, the variety of food and consumer goods probably reflects what rationing was like for us in the last war. I have been in a number of little village stores looking for a snack and the shelves have been empty. If you do find a packet of biscuits, maybe even with a filling, the price will so high for the average Cuban that it will only ever be a treat. Don’t get me wrong, no one is underfed, but choice is extremely limited, making eating sometimes a boring repetitive experience…..but not for the average tourists, of course. This is a fairly typical breakfast, and never lacking in abundance. As a chocoholic, can I service my addiction in Cuba? Definitely not….I have yet to see any chocolate of any description in places where the locals shop. As I climbed over the Sierra to Los Vinales, I caught this pig skulking by the roadside, appearing not to belong to anyone. And as I crested the mountain, I was treated to this view of the famous mogotes of the Valley….so famous, they attract the tour companies with their hordes of tourists. And I, like every other tourist, don’t regard myself as one of those….No, no, of course not…..after all I do ride a bike. Erm……d’you think I might have a complex? And sorry to bore you with bike issues again. One of the ‘new’ pedals stripped the threads off one of the cranks…..I eventually found a bunch of young bike mechanics who eventually found a solution…..another crank. They got one by asking around the neighbourhood….they are resourceful bunch of people. My first night in a casa particular was a perfect introduction to the real Cuba. My host picked me and my bike up at the airport in an old Eastern bloc Lada, stuffed my bike in the boot, took me to his beautiful home, fed and watered me and gave me a comfortable room……and didn’t worry that I didn’t have the currency to pay him. No worry, he said, we can sort that out tomorrow. In the morning, not only did I have to look for a cadeca to change my sterling into CUCs (which you can’t purchase outside Cuba), but I had to find a pair of pedals to replace the ones I had stupidly left on the garage floor at home. I found a young black African Cuban with a small tabletop stall selling bike bits, and it didn’t surprise me that he couldn’t supply a pair of Shimano SPDs…..so I made do with a simple pair of ‘rat traps’. So I and the bike were ready to roll by 10am….. But my northern clime body had to make a rapid adjustment to the heat…as the day wore on, the temperature rapidly rose through the 20s, probably peaking at about 27C, and there was rain in the air….and later on rolling thunder claps that got ominously near. As I headed west, I was enveloped by images of the 1950s, of pre-revolutionary Cuba, with classic Buicks and Chevrolets all lovingly restored, but all sickenly belching out noxious clouds of fumes. The truck drivers had no idea that their ‘gentle friendly toots’ were deafening blasts of their claxons that made me jump out of the saddle. And what I took for cattle trucks turned out to be passenger bearing buses. In some cases they were open-backed lorries with the passengers standing shoulder to shoulder, as if they were being transported off to some far distant gulag. When I got to Las Terrazas, I discovered a gated community with a 2CUC charge for entry. The gate keeper explained away my puzzlement by telling me I was entering a biosphere reservation, and then promptly promoted his brother’s casa particular for my night’s stopover…..the kind of marketing I would normally ignore, but Noel (his brother) came out to meet me, and I liked all his answers to my many questions…..and besides, he was already hosting a German lady and a Danish lad, so it sounded like promising company for the evening. 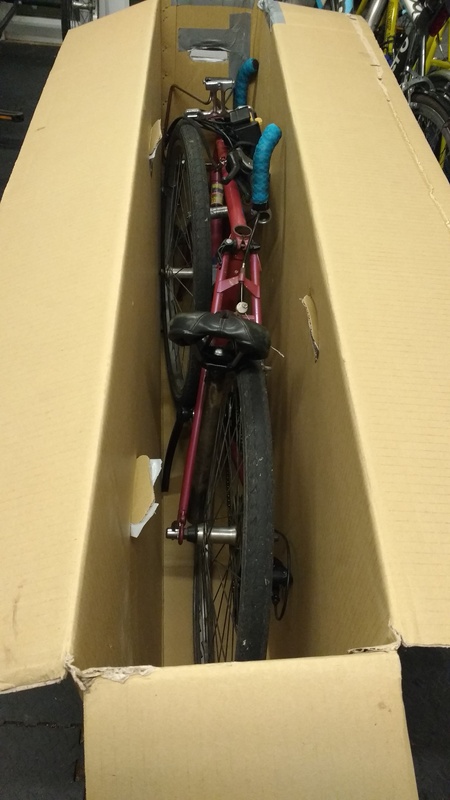 Getting to an airport with a boxed bike, avoiding ridiculously expensive taxi fees, sometimes requires a bit of lateral thinking. My journey to Gatwick will be by train, but on a Sunday it means I have to change trains by commuting between two stations in London. This means a bit of trundling with the heavy box (only to the taxi rank, mind) so to minimise carrying, I have fixed a couple of furniture wheels to the base, in the hope that I’ll be able to pull it along like an oversized suitcase. The theory is great, and I wonder what Heath Robinson would have said about its simplicity? But of course, its practicality will only be proven by its durability…….will it survive the journey? Platforms and pavements can be unforgiving at times…. The bike is now waiting for it’s no-return journey. After more than 25 years occupying a corner of our garage, it is now off to pastures new…..to a climate that can caress with its warmth, but can also scourge with its tropical rainstorms and hurricanes. Will it survive another 25 years? You see, on Christmas Eve I felt one of those annoying winter infections beginning to take hold and, thinking I would be on the mend within a few days, it just got worse and worse, till I got to the point where this trip was very much held in the balance. Ten days later as I began to slowly emerge from the depths, a plan B gradually formed in my brain, the least taxing option being to just get myself on the flight and over to Cuba without the bike, and take it from there……either hiring a steed for the duration, or just on an ‘as-needs’ basis to do a few local rides. Then a modification formed to that version of the plan, involving the use of my 25 year old Raleigh, the frame of which I had broken in New Zealand, and which had been repaired by a local boat welder in Queenstown. That was 6 years ago, and it had only ever been ridden sporadically since then for a bit of off-roading. Given that the Raleigh is now superfluous to my needs (my Dave Yates has now replaced it) my current plan is to ride it in Cuba and then give it away, saving me the hassle to boxing it up for the return flight, and providing someone with (perhaps) a much needed bike. Cubans, after all, are renowned for their ability to ‘mend and fettle’, and since bicycles are a bit of luxury for many Cubans, I expect it to find a new eager owner with relative ease. Cuba, as many of you know, is a singular place. It is still suffering the austerity of a blockade by the Americans, and many everyday items are difficult to find, especially for resident Cubans. And with access to the internet being extremely limited, it is likely that posts on my blog will be sporadic and intermittent. A blessing you may say but, as ever, I promise to make my contributions to the world’s fountain of knowledge with pithy and ‘short-winded’ offerings.